My viewpoints and sentiments exactly! Good analysis, Paul. This is good for the prospect of education. Coupled with today's SCOTUS 1st Amend ruling, clock riding professors may find themselves getting schooled. "I have at times complained about Governor Mitch Daniels' failure to exercise strong oversight over state agency officials and the decision to ignore whistleblowers who have pointed out problems at the agencies. It is frustrating to me that Governor Daniels otherwise excellent tenure is marred by scandals and mismanagement that were entirely avoidable." Oh, great. Now Daniels can start selling off Purdue's assets! Considering how well that's worked out for the Toll Road, I shudder. What else will he do? Ban genetic research in the ag department? Politics and education are a bad, bad mix. Ellen, we've given higher education administrators a green light to raise tuition and costs ever year with zero accountability for containing the cost of higher education. Now there is someone who is going to hold them accountable. I can't help but think that will be a good thing. "There is this sort of shift in the zeitgeist," says Tal Brewer, chair of UVA's Philosophy Department. Brewer sees a new, heightened cultural "adoration of the business mind as capable of bringing clarity, organization and efficiency to any kind of institution...I just think that's a deep mistake." "In an era in which the best and the brightest financiers laid the groundwork for the worst economic crisis since the Great Depression, and the Supreme Court allowed corporate sponsors and wealthy donors to upend the political system with unlimited campaign contributions, Brewer says he sees the upheaval in Charlottesville as more of the same." While I agree that ever increasing tuition costs are a problem, I disagree with the idea that Mitch Daniels will bring Purdue's tuition under control. If you would want to revisit this issue in say summer, 2015 when Purdue announces the tuition cost for the 2015 to 2016 academic year, I would really pay attention. My prediction is that Purdue's tuition will have increased by approximately as much as IU's. It does not matter to me if Mitch brings Purdue's spending under control, if nothing is done to control Purdue's tuition. 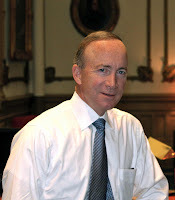 If you could suggest some other way of measuring Mitch Daniels' success or failure, it would be useful.